Love, Mrs. Mommy: BRIO Fire Station & Suspicion Giveaway! $100 RV! 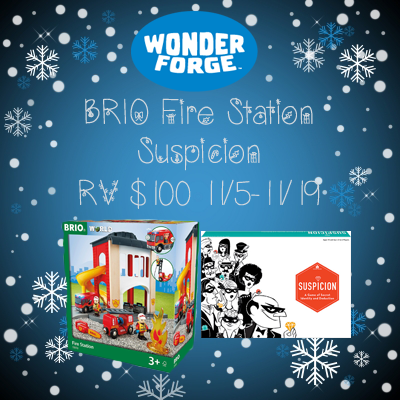 BRIO Fire Station & Suspicion Giveaway! $100 RV! These wonderful prizes could be yours if you enter today! Good luck! My dad makes really good wild rice which is my favorite dish of the holidays. I love my mom's cheesecake!! She makes them from scratch and makes a different one each time!! Is always a suprise and they are always delicious!! I love a delicious Christmas turkey! Not so much a dish, but my Great Grandma's pumpkin pie! I only get it at the Holidays, its excellent! I like spinach and artichoke dip. I have been gaga over my mom's homemade cranberries for as long as I can remember. Cranberries, ginger, orange... I honestly prefer it to pie after dinner. Sooo good! As always dessert is my favorite dish!